There are a lot of opinions about open plan offices, most are negative. If you think open plan offices are a nightmare then the latest report from the Harvard Business Review will do little to water down your opinion. New research shows that people find them increasingly frustrating and don’t understand their purpose. For a while now open plan offices have been accused of causing low motivation and high stress but the argument has always been that easy communication between colleagues outweighs the disadvantages. This latest survey suggests that communication is at the heart of the negative issues most workers have with an open office space. The survey took the opinions of 42,700 American workers, most of which said that the lack of privacy was the biggest downside of an open plan office space. Other issues included fellow worker’s mess, a lack of personal space and the general noise level, particularly when a noisy department sits in the same area as one that needs quiet to carry out its duties. Putting the management with the workers was another point brought up by those surveyed. The lack of distance between those making decisions and those affected by the decisions can cause workers to “hold back” in their job for fear that they’re being overheard by their boss. This sort of self-consciousness is often debilitating and can be detrimental to the work. The survey showed that half of all workers surveyed cited “lack of sound privacy” as their biggest concern. It was the biggest cause of annoyance uncovered by the Harvard Business Review survey. 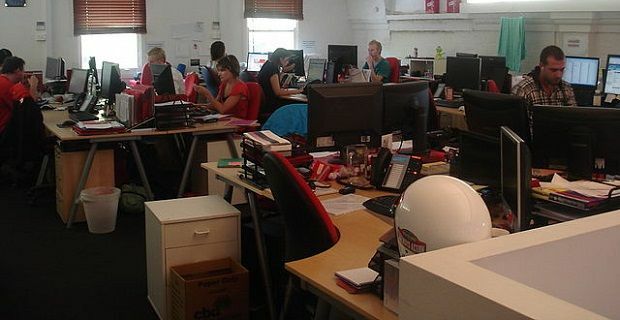 Whether open plan offices make you sick, as some people believe or if they’re just an ergonomic nightmare, the space saving is minimal so most workers who took the survey couldn’t figure out why this type of office layout remains so popular with modern businesses.